This is a list of pre-release and unused content for Paper Mario: Color Splash. The game features a concept art gallery in which concept art is gradually unlocked by donating Battle Cards to the museum. The concept art allows to see how the characters, objects and settings were gradually changed during development. 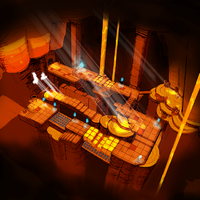 The concept art gallery reveals two locations that were cut from the game. A few characters underwent several changes in their design before their final one was finalized. Concept art showing various early designs of Huey. One of the early designs of Huey was similar to a Swoop with colors ranging from red, to yellow, to white, a radial crest and a face similar to that of Chuck Quizmo and Grubba, with sunglasses and a blue bow tie. A uniform grey design with a single tuft, a ghost-like face and a red bow tie was then tried. Several designs of bottles were also attempted. Two of those featured a mouth, one of them had wings, another one was colored with the three colors used by the Paint Hammer (blue, red and yellow), and a further one was more similar to an ink bottle, complete with feather. 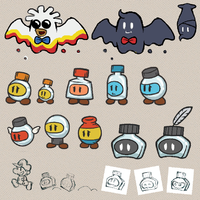 Three different expressions of the ink bottles were drawn (thoughtful, happy and angry), and it is shown that they were meant to follow Mario by bouncing on the ground instead of flying like Huey does. 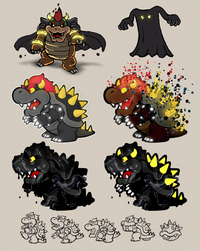 Concept art showing various early designs of Black Bowser. In one of the early designs, Black Bowser was going to be normal Bowser possessed by a black cape with yellow eyes. As a consequence, his cuffs and eyes would have shone of a bright yellow, while the sclera would have become black. A new design instead was a recolored Bowser in which the mouth, the eyes, the eyebrows and the hair were red, the spikes, the horns and the sclera were yellow, while the rest was in greyscale. A different version of said design would have had some of the coloring of Bowser being still visible, except for the back of the shell, while the pupils and irises would have not been visible, some parts like the hair would have shone and and drops of paint would have continually evaporated from him. Two designs more similar to the final one were attempted, with Bowser covered in black paint, the red tongue being visible and the eyes being red with a yellow sclera. Both a version in which the claws, horns and spikes were still normally colored and a version in which they were fully covered by black paint were drawn. Finally, some poses of the early designs were drawn: one of him looking behind surprised, one of him looking at someone going up in front of him, one of him breathing fire, one of him blocking someone with his hands, and one of him spinning in his shell. Concept art showing various early designs of the Rock Paper Wizard. Several designs of the Rock Paper Wizard were attempted, which consisted of Toads being hidden by a white sheet with at least holes for the eyes. In one of them he was a Toad dressed like a Duplighost with white eyes, a red bow tie and a jester hat with an orange and violet zigzag pattern at the base and the three shapes of Roshambo at the tips, each one tied to a particular pattern: cyan and light blue longitudinal stripes for scissors, yellow and dark yellow transversal stripes for paper, white polka dots on magenta for rock. He would have used signs to indicate what shape he was playing. In another one he was similar to a white Lantern Ghost with a red bow tie, with a stick colored yellow, cyan and magenta having at the tip the shape he was going to play. Two designs simply consisted of a Toad covered by a white sheet with holes for the eyes. One of them had black eyes with yellow pupils, while the other had a mouth with a content expression, holes in the eyes that allowed to see the Toad inside and a 「じ」 character from Hiragana on the head that might have had various meanings. Another design had a Toad covered by a white sheet with small holes for the eyes and a large hole for the mouth, used to see around, wearing a magenta, cyan and yellow turban, with a blue stone surrounded by a gold ring and what looked like a white feather, that might have been made with a white sheet. He would have used sticks, each one with a hand on the tip, to simulate his hand and to show the shape he wanted to play. Along with the turban, also a violet Top hat with spots of yellow, magenta and cyan spots was drawn. Finally, a design would have involved two Toads, one standing on the cap of the other, with the sheet covering both of them and having holes for the eyes and the mouth, the latter of which would have been used to see around. The tip of the sheet would have been colored with magenta, yellow and cyan paint. Concept art showing various early designs of the Shy Bandit. The Shy Bandit was meant to be a Black Shy Guy from the beginning, and in all cases except one a grey Slurp Guy, however several ways to convey that it is a bandit were attempted. Three of them were different to the final design in that they relied on a green sheet that either formed a hood and had swirls on it, or formed a sack tied to the bottom of the mask. In the first case two designs were attempted, one was the only design in which the Shy Bandit was a normal Shy Guy with a hood tied in a way that covered the mouth that fully covered the hat with a lighter green color and less swirls of a darker green color, the other had a hood tied to the bottom of the mask that did not fully cover the hat and was of a darker green color with many swirls of a light green color. In the designs similar to the final one, three designs of the glasses were tried, one of which had magenta glasses with an area for the nose defined with sharp angles, another had a grey glasses with a more gradually defined area for the nose and shapes that remained wings at both tips of the glasses, and the final design, similar to the magenta glasses but with a different color and with a more gradually defined area for the nose. Of this latter design, several color for the eyes, the mask and the glasses were tried: the first one had black eyes, black mask and red glasses, the second was red with the left eye white and the right eye black with the mask using the same coloring as the eyes, the third was the one actually used in the final game, with a white mask, black eyes and red glasses, the fourth had alternating red and white colors, with the mask and the eyes having the same color and being red on the right side, while the glasses had the opposite color, the fifth had a white mask and eyes and red glasses, the last one had on the right side black mask and eye with white glasses, while the in the left part the mask and eye were white while the glasses were red. Concept art showing various early designs of the Chosen Toads. An early design of the Chosen Toads had them being Red Toads with more varied shapes of the keys. A design of the shapes of the keys more similar to the final one can be seen in the sketches, which also show how the Chosen Toads were supposed to disappear, how the key was meant to appear and how the Chosen Toads were supposed to use their keys. Concept art showing various early designs of the Toads of the Rescue Squad V.
Among the early designs of the Toads of the Red Rescue Squad V, two of them only wore stars on the head that distinguished them from the other Toads, while another design relied on a bent head. Another design with the bent head had uniformly red outfits, while other two design with the uniformly colored outfits also had another yellow distinguishing element, either a star pinned to the jacket or a scarf. 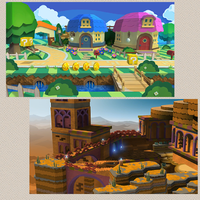 A variation of the final design was also made that had the outfits used in the final game, along with a yellow scarf and a lamp similar to the one used by Captain Toad. Only a preliminary design of the Toads of the Blue Rescue Squad V is shown, having a yellow scarf instead of a light blue scarf used in the final game. Two preliminary designs were made of the Toads of the Yellow Rescue Squad V having the typical outfits of Toads with different colors, as the jacket and belt were dark grey and the jacket was orange. The difference among them were the yellow distinguishing elements: a scarf in one case and the yellow star in the other. Concept art showing various early designs of the Foreman, the Captain and the Legendary Captain. A few designs of the Foreman were attempted, two of them showed him wearing the hat of modern authorities, of which one even had the elegant outfits. In two designs he had blue and light blue outfits typical of mechanics and spots of oil or dust on his face, cap and outfits. One of them even had a blue hat with spots of oil or dust. 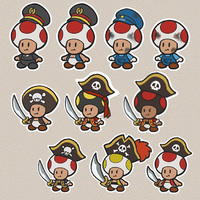 The Toad Captain had several early designs as well, two designs were characterized by a sword, a hat and a jacket typical of pirates' captains, one of them had a red jacket, a darker skin tone, a black cap with red dots and a skull on the hat, the other had a dark grey jacket and a skull with crossed bones behind on the hat. Only one design of the Legendary Captain is shown, having a sword like that of the Captain, a red jacket and a hat with a skull on it and a red ribbon around it typical of the pirates' captains, and a black cap with yellow dots. Finally, a common design was also attempted, which had a sword, the typical outfit of a Toad with a black jacket and a pirate hat with a white mushroom having crossed bones on it in place of the cap. An unused sprite of Princess. There is an unused sprite of Princess that uses the Chain Chomp sprite from Paper Mario: The Thousand-Year Door, though with a pink bow on its head. An unused Huey Replica card exists in the game's data. If Mario uses it, it acts like a Jump card. In the game's code, it is revealed that the Super Ludship is supposed to have an attack that instantly defeats Mario, called the Lud-Cannon Blast, that is hinted by Ludwig, along with a line that suggests the player to use the Tail Card. The Super Ludship would fire many projectiles dealing 25 HP of damage each. In the final game, the event that leads to the attack does not appear to be able to be triggered. ↑ Crunchii (September 26, 2016). The Final Paper Mario: Color Splash Stream (Thank You Everyone). YouTube. Retrieved September 26, 2016. ↑ Getlucky12341. (February 13, 2017). Paper Mario: Color Splash HACKS! - Glitch Showcase #3. YouTube. Retrived February 16, 2017. ↑ a transcrition of the Unit Data table and of the Weapon Data Table of the game. ↑ Getlucky12341. (November 10, 2016). Paper Mario: Color Splash HACKS! - Huey Card outside of Boss Battle, Custom Music, Inventory Hacks!. YouTube. Retrived February 16, 2017. ↑ As indicated by the BB_BossBattle_Ludwig_10 line of dialogue, that states Not even you could withstand my power, Mario... Now, meet your doom. Lud-Cannon Blast! ↑ Said sentence is the BB_BossBattle_Ludwig_09 line of dialogue that states Gweheh! You're going to fight my Super Ludship with THOSE cards? You'd best turn tail and run! ↑ As shown by the LDW_BULLET_KILL_ATTACK in the Weapon Data Table of the game. This page was last edited on January 14, 2018, at 01:19.